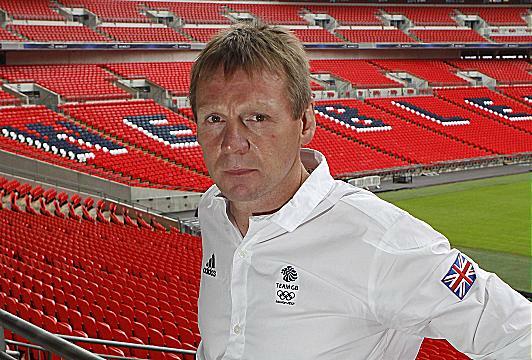 Stuart Pearce is one of England’s best known and most loved football icons. An electrician by trade, Stuart started his playing career at non-league Wealdstone. He signed for Coventry at the age of 21 and quickly established himself as a tough but fair left back with a lethal left foot. After 2 years at Coventry he moved to Nottingham Forest where he spent 12 years, 11 as Club Captain. Stuart’s loyalty, commitment and dedication to the club led fans to affectionately nick name him ‘Psycho’. Spells at Newcastle and West Ham followed. While at Newcastle the team reached 2 FA Cup Finals and competed in the Champions League. Stuart finished his playing career at Manchester City helping them to win the Championship, before hanging up his boots at the age of 40. Stuart went on to represent his country 78 times of which 9 were as Captain, playing in the 1990 World Cup and both the 1992 and 1996 European Championships. Stuart’s emotional celebration on scoring his penalty in ‘96 has become one of football’s most iconic images. In 1999 he was awarded an MBE for his services to football. Stuart was made caretaker Manager at Manchester City and after a successful start was given the job full time, staying at City for 2 years. Stuart was then appointed England U21s Head Coach, during his 6 years in charge he took them to 4 successive U21 European Championships and reached a semi-final and Final. In addition Stuart was given the honour of Managing the Great Britain Olympic Squad at the London 2012 Olympic Games. Since his departure from Forest, Stuart has been using his football and business acumen to great effect, transferring his knowledge and skills to the corporate market. Stuart has a wealth of experience in leading and motivating individuals and teams. His passionate approach and inspiring insight comes from his extensive personal experiences coupled with knowledge gained from time spent with leading coaches and managers across numerous sports. Stuart’s extraordinary journey from warehouse worker, electrician and amateur player to Premier League footballer, England Captain and England and Olympic Manager, highlights his determination to succeed. Stuart is also working regularly across the major broadcasters as a pundit, studio guest and cocommentator. Stuart is available for motivational and leadership speaking as well as Q&A and after dinner speaking.